it’s normally the case that sleazy socialist politicians and bureaucrats find ways to turn sows ears into silk purses…all they need is an issue… with a few teary eyed youngsters… a gaggle of well meaning but ill informed taxpayers… and presto! higher taxes and more cronyism…the socialist democrat motto: “never let a crisis go to waste”…. defecating on the streets is not a practice that a civilized municipality can tolerate… hepatitis A is killing people in southern California… homelessness and the smell of human excrement is destroying the tourism industry in SF… the city is literally becoming a SH-T hole… over the long term the lack of affordable housing and it’s related maladies will cost the city and state billions in lost revenues… California government is suffering from the same delusions and lunatic policy choices as other crypto-communist jurisdictions around the world… it isn’t much of a stretch to imagine California as a new Venezuelan in a decade or two… (particularly if they were to secede from the union…) the wealth the state has accumulated throughout it’s history can be destroyed in a few years… by a government cursed with a Utopian vision… and a penchant for delusional policy choices… and stupidity… to become a haven for the world’s indigent… rid the government of checks and balances… and rule forever…. who was it who said it’s better to rule in hell… than to serve in heaven…. wasn’t that the socialist democrats? 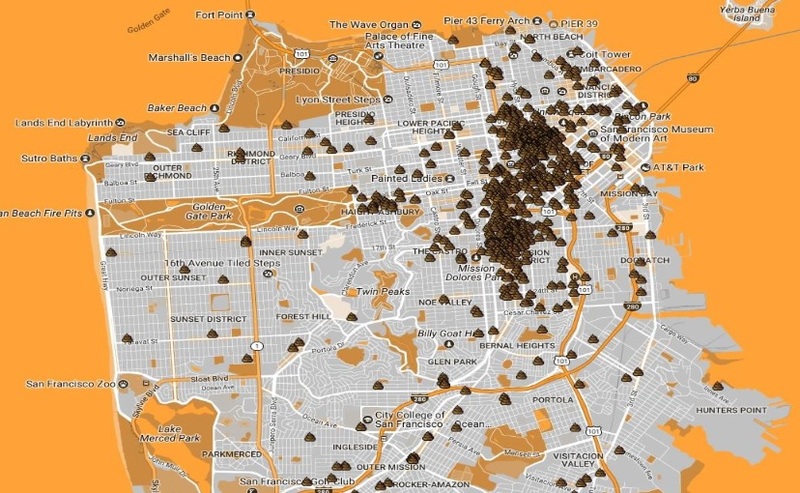 The poop problem is minor compared to the fact that residents of San Francisco have to work an additional fifteen years with every penny earned going towards repaying the average San Francisco house. That is caused by restrictive zoning laws in San Francisco itself, but more importantly by statewide regional zoning laws, whereby San Francisco politicians — and the voter-lemmings who elect them — can prevent creation of new housing not only in San Francisco but also in the wider Bay Area region, so that no city can create cheaper housing in the wider area without San Francisco approval. Hence, no California voter can escape the consequences … of his very own voting pattern. Ultimately, its a “resource curse”. The geographical endowment of California’s good weather creates bad statist policy. Tesla driving elites govern the homeless — who get what they vote for — and thus ultimately deserve. Reblogged this on Truth Is Power.